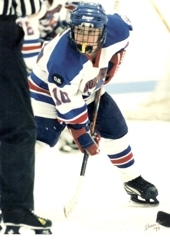 More than the two state championships and 241 points he amassed in three seasons, T.J. Oshie’s career at Warroad could just as well be summed up by a 20-second clip of “stick tricks” shown on YouTube. 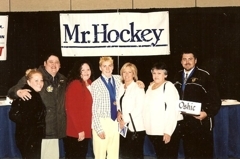 A camera crew inside the Warroad locker room caught Oshie, wearing a dress shirt and tie, warming up for the Warrior’s 2005 state Class 1A championship game against Totino-Grace by alternately bouncing and rolling a stickhandling ball off the blade and handle of his stick. Teammates are shown laughing in the background. At one point, a piece of wadded up tape sails into the picture and pelts Oshie in the stomach. And still he presses on, never losing that ear-to-ear smile. This is one kid who knew how to have fun. Oshie, in talking about his playing days at Warroad, has said in multiple interviews that some of his fondest memories are from the hours upon hours he would spend with his teammates in the locker room after practices. “I remember after some practices we would still be at the rink two hours later, hanging out in the locker room with our equipment still on,” Oshie said. “We’d be there so long the ice would be open again. The post-practice locker room sessions weren’t unlike the one before the 2005 title game. Kids hanging out and having fun. Joking and laughing. Oshie excelled at most everything he tried. Cary Eades was teaching physical education at Warroad High School when Oshie arrived in town as a sophomore. 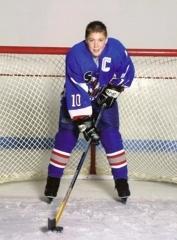 “He had fantastic athletic ability,” said Eades, Warroad’s coach during Oshie’s sophomore and junior seasons. “He was just starting to realize his potential. I remember T.J. from phy ed classes, and he was better than the basketball players at basketball and better than the baseball players at baseball. 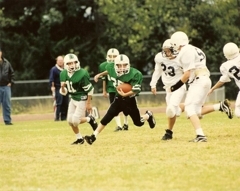 Oshie was a running back on the Warriors’ football team and played golf in the spring. His biggest passion was hockey. 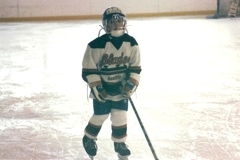 Oshie’s unbridled potential – along with his family’s lineage in the sport -- spurred his move from Everett, Wash., to Warroad in 2002. Oshie’s grandfather, Alvin “Buster” Oshie, and great uncle, Max Oshie, were standout players on Warroad’s 1948 state runner-up team. 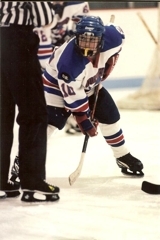 Oshie had two assists as Warroad beat Simley 3-1 for the 2003 state Class 1A championship. 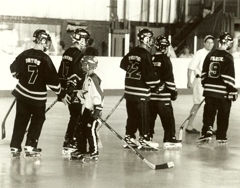 The Warriors won the 2004 consolation title after being ousted by Orono in the state quarterfinals. 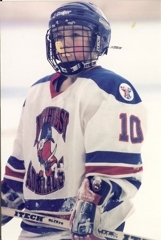 In 2005, the 5-foot-10, 170-pound Oshie set up the overtime winner against Totino-Grace by poking the puck ahead off a face off and, while diving forward, dishing it to an open Aaron Marvin at the side of the goal for a tap-in. 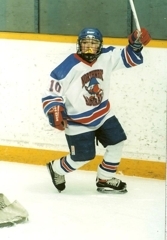 Oshie, a first-round draft pick by the St. Louis Blues in 2005, was heavily recruited out of high school. He gained instant stardom at the University of North Dakota, where he scored 23, 17 and 18 goals in his three seasons before turning pro and joining the Blues. Oshie’s infectious passion for the game never has waned. His energetic, all-out playing style has made him a fan favorite in St. Louis, where he scored 44 goals in 182 games in his first three seasons.